I grew up in England on a standard farm diet. 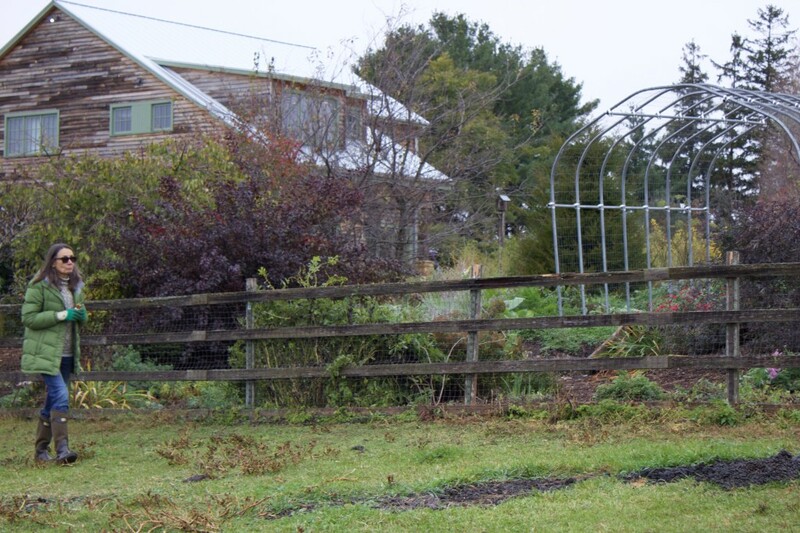 We produced everything we ate from meat, dairy, eggs, and honey to vegetables and fruit. It wasn't a plant-based diet, but it was a healthy one. As an adult, I have experimented with vegetarian, vegan and macrobiotic diets but I found that plant-based food is what I love most. It is challenging and creative. So when I bought 120 acres of farmland in Wisconsin the first thing I did was plant the most exotic fruits and vegetables that I could find. One of the first trees I planted was a quince. The quince that started the Trojan war in Greek legend and the fruit with which Eve tempted Adam. My earliest memory of quince is from one of my favorite childhood poems “The Owl and the Pussycat” by Edward Lear. In it the owl and the pussycat were married by the turkey on the hill and “they dined on mince and slices of quince”. Of course, as a child I did not know what quince was, my family did not grow quince trees and I had never tasted one but that made it even more interesting. The quince tree is very beautiful. It is small and nicely proportioned with big fruit and it is very easy to grow. It does not require pollination so only one is needed and with sunlight, good soil, and patience the reward will be lots of great fruit. It is difficult to find in stores so if you have a small garden go for it – grow your own. I still have my first quince tree planted over ten years ago and I have now planted a second one. The quince fruit is gnarled and hard and you cannot eat it raw but pick it early and put it in a pretty dish in your kitchen and you will love the fragrance. There is so much you can do with it from quince paste, which disappears like candy around here, to jam, jelly, and compote. My tree produced so much fruit this year that I had plenty of paste, jam, syrup for ice cream, and compote. It is difficult to cut, peel and core so use a sharp knife and be very careful. As you work you may even be tempted to swear but resist that temptation because once you start to cook the quince it turns a beautiful ruby shade just like the color of autumn leaves against the sun. 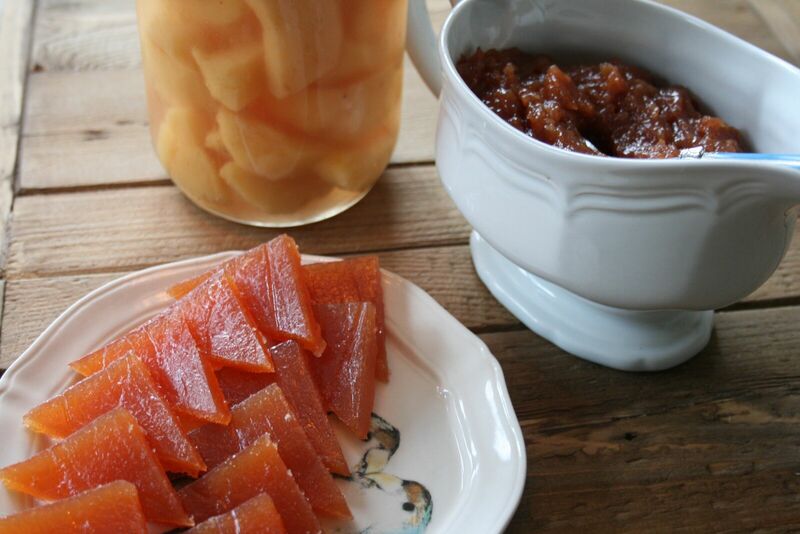 Today, I‘ll be sharing my favorite recipe for quince paste, a lovely treat that has the consistency of gumdrop, or jellied snack, and pairs well with crackers and cheese – we suggest pairing with a nice almond cheese, as a dairy alternative. 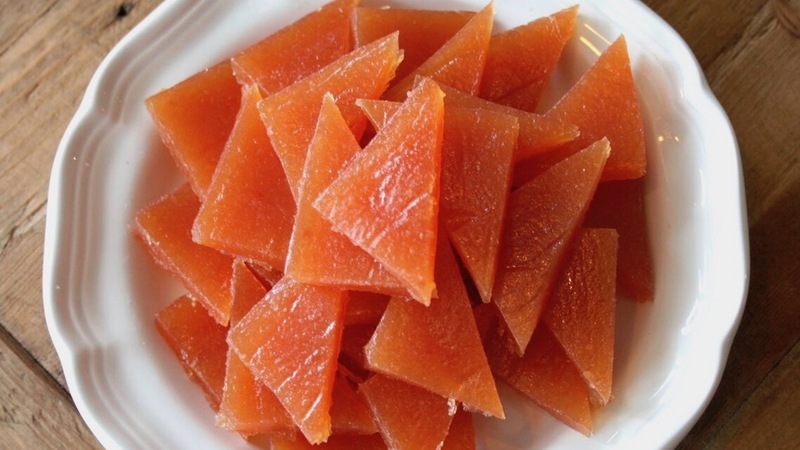 In Spain, the paste is called membrillo and is traditionally eaten with manchego cheese but tastes great with other vegan options. 1. Pick quince that are firm and bright yellow. Some will have a fuzzy skin and that should be washed off. After coring cut the quarters into small pieces, place in a large pot. Add the water, bring to a boil and cook until the fruit is soft. This will take about 15 minutes. Pass it through a food mill. I use the Victorio food strainer and it works very well. 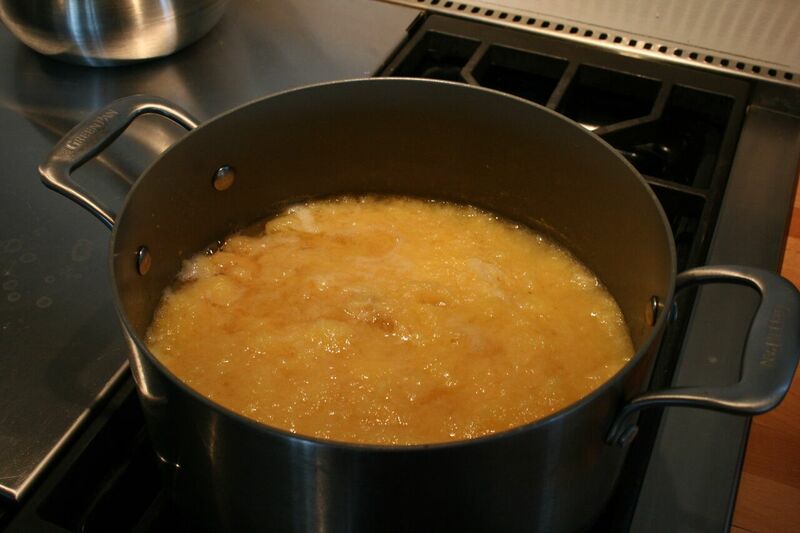 Return the puree to the pot, add the sugar and cook on low heat stirring all the time. It can take between 40 minutes to an hour. It has reached the right consistency when it mounds up in the pot. When that happens add the lemon juice and remove from heat. 2. Line a shallow pan ¼” high with parchment paper and oil lightly with vegetable oil. Pour the paste in and let it cool. It should thicken quickly. When it has cooled invert onto another sheet of paper and peel of the oiled sheet. If not dry overnight put in the oven at 150 degrees for about an hour. Stored in a dry place it will keep for a year. When serving lightly dust with confectionary sugar. If you have a problem getting it to set, you can put your mixture in a jar to use as tasty jam to serve with oatmeal or on toast.